Today marks the end of week one. Woohoo! I did an entire week! Sometimes I give up before the first week is up, so I am glad to still be trucking along. One of the habits I created was saying the Angelus prayer at noon (or close to it) every day. It isn't a very long prayer, but it helps establish a habit that I hope to expand upon in the upcoming week. As a quick recap of this week, I learned that Mary's generosity cannot be out done, so whatever we give her, she will give us back. Also, she will augment everything we give to her. She knows us and she respects that we care about our loved ones so she will take better care of them than we could. Fr. Gaitley recounted a story of someone who had prayed for his atheist mother and asked Mary to take care of her. After his mother died, he was filled with grief, but Mary reminded him that she had taken care of his mother's soul for him. So Mary wants us to continue to pray for our loved ones. She can just do it better than we can. And the best part? Mary can make our crosses sweet. There are many people who just don't understand the "offer it up" part of spirituality. It doesn't make sense to them. But if we offer up our crosses, she will make them more bearable. In the book Fr. Gaitley equates it to eating under-ripe fruit that has been put into sugar. It still might be tart, but it is easier to get down with the sugar. Tomorrow I will begin week 2 and study St. Maximilian Kolbe and his tender devotion to our Lady. 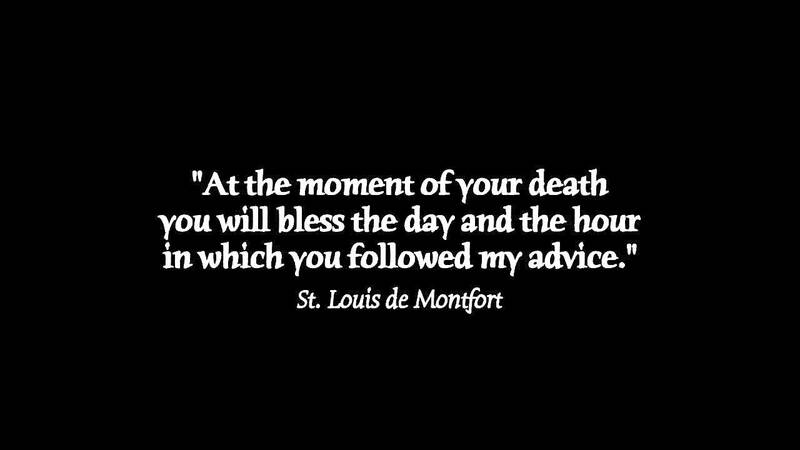 St, Louis de Montfort, pray for us.